Do your Oriental rugs in need of repairs ? Do your rugs need re-weaving or rebinding? Are your rugs’ fringes getting worn, dirty, ripped, or discolored? for you. Schedule an appointment and we will pick up the Oriental rug or rugs you need repaired. Your rugs will be inspected and you will receive a free quote for the cost of your Oriental rug repairs. Once approved, we will handle the process of repair, cleaning, and delivery of your restored Oriental rugs. We’ll put your rugs back where we found them. That was too easy. 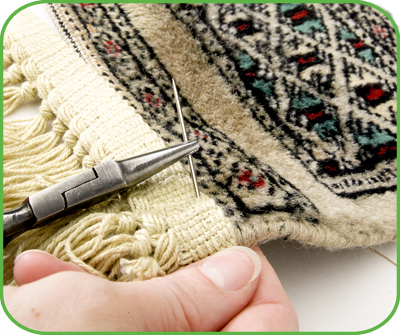 KIWI offers a one-year rug repair guarantee on all of our rug repair services. We want our customers to feel secure when they choose us for rug repairs, which is why we offer our one-year rug repair guarantee. If you should run into any issues during that time, give us a call and we will perform a complimentary re-do. We also offer a 30-day clean guarantee on our rug cleaning services. KIWI also offers rug odor removal services for rugs that have stronger than usual odors. *We do not clean or repair rugs made of Sisal or Jute. These rugs are made of natural plant materials that typically break down under professional cleaning processes.